Just a little clock. Hope you'll like it. I work on a new big project right now - SD SideBar. I make it because I don't like Vista Sidebar Gadgets because of their primitiveness. At the same time I can't make these Gadgets with DesktopX because they work extremely bad. You may go here to look on my Great Shame (just read a comments...): WWW Link. The SD desktop is one of the first things I found back when I first started looking. It's a great theme. Nice addition to it. Ya know....I'm running out of room for all your stuff! Great job Vad! My Great Gratitudes to everybody! 1. The alarm sound only plays once. I think it should continue playing until you stop the alarm (or at least have a setting to allow it). 2. A way to choose the sound for the alarm would be nice. 3. I haven't tested it yet but does the Mini Clock allow you to set and save multiple alarm times? I like the fact that it has 24hr (Military) time. 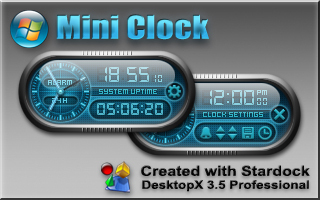 I decided to make one more widget named Micro Clock. This widget will be considerably less than Mini Clock. It will play alarm sound over and over as well as it will allow you to change this sound. Vad, you make some elegant and intricate gadgets & widgets but I have the same problem with almost all of them. That is, if I use them on a regular basis (auto-run) I have to frequently clear the DX caches, widget or gadget or both, to get them to load and run properly. I have not found a common set of occurrence for the failures but it seems to happen most often when I download various program updates with Firefox browser and then install them. My OS is XP Home Pro Edition.